This article is about the first game in the Donkey Kong Land series. 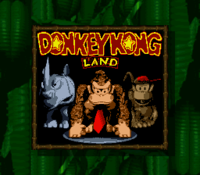 For the series itself, see Donkey Kong Land (series). Donkey Kong Land, known in Japan as Super Donkey Kong GB, is a video game developed by Rareware for the Game Boy. Released in 1995, it is a handheld follow-up of Donkey Kong Country. It is one of the few Game Boy games with a uniquely colored cartridge (yellow), which is also the case for its two sequels, Donkey Kong Land 2 and Donkey Kong Land III. 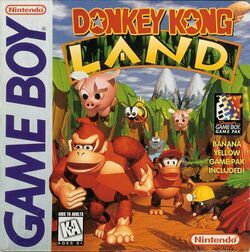 Donkey Kong Land is among the first Game Boy titles specifically designed to have Super Game Boy features, including a rendered jungle border across the television screen. Donkey Kong Land was later released for the 3DS's Virtual Console in Japan on April 2, 2014, in Europe on October 16, 2014, in Australia on October 17, 2014 and in North America on February 26, 2015. The game is often mistaken as a Game Boy port of Donkey Kong Country. Although the two games play the same using the same engine, the storyline is different and Donkey Kong Land has different levels, enemies, and bosses from the ones featured in Donkey Kong Country. Unlike its sequels, Donkey Kong Land has unique enemies and bosses from its Super Nintendo counterpart. The story is told in the game's instruction booklet and features a lot of fourth wall references; it takes place after the events of Donkey Kong Country, where Donkey Kong and Diddy Kong discuss their latest adventure to Cranky Kong. Cranky admits that it was more successful than he thought, but claimed that it was only because of "fancy graphics" and that "Kids'll buy anything nowadays." As Cranky rambles about the games of his time, DK and Diddy try to convince him that Donkey Kong Country was great because it "was just plain fun." Cranky remains unconvinced, and he challenges Donkey and Diddy to an adventure on an 8-bit black and white system (Game Boy). After they made the bet, Cranky arranges for King K. Rool to steal the Banana Hoard overnight. While Diddy originally agreed to the bet, Donkey Kong was furious because he wanted to watch the Banana Bowl. However, he reluctantly decided to go on an adventure with Diddy to retrieve the Bananas from K. Rool. Donkey Kong Land is a 2-D platformer, designed for the Game Boy. Because of the Game Boy's limitations, the game offers less than its 16-bit predecessor. Graphics were ripped from Donkey Kong Country and downgraded to 8-bit to fit Game Boy's limitations. On the level select screen, names of the stages are no longer present, and each level has very few Bonus Areas, usually one or two. Only one Kong displays on-screen at a time, either Donkey Kong or Diddy Kong. Additionally, after the Kongs find all the Bonus Areas in an area, an exclamation point appears above the level's circular marker in the overworld. The game is divided into four worlds, each with seven normal levels, with the exception of the game's first world, Gangplank Galleon Ahoy!, which contains a total of nine. A boss level also appears in each world and must be completed to progress. Though most levels are unlocked after beating its previous level, some levels can be accessed before later levels. This can be done by finding rare, barrel-shaped bombs inside some levels and blasting away large boulders. With these boulders destroyed, a passageway to a certain level can be found. Unlike in Donkey Kong Country, the Kongs will be able to travel freely to any level without any assistance, as they can simply journey world-to-world on foot. Like in most platformer games, the goal is to reach the end of the level, without being defeated by an enemy or falling into a trap. The Kongs must make their way through each level carefully, or else an enemy may attack. When this happens, one of the Kongs in the group will run away. With one hero remaining, the player must be careful, as losing both Kongs results in a lost life. The missing Kong can be recovered from a Buddy Barrel, which appears in every level. Star Barrels were replaced with a different type of checkpoint, the Continue Points. Up to three can appear in a level. If the Kongs activate a Continue Point, their progress is temporarily saved at the point, and they would return to that point if they lose a life. Every level has a small portal for an end goal, the end of stage. The Kongs must jump into it to exit the level. As in the SNES game, Donkey Kong and Diddy Kong are the only playable characters. The stats of these apes both vary, just as in the previous game. Donkey Kong, the leader of the group, does not have as much speed as his partner, Diddy, nor can he move quite as fast. He is, however, much stronger and is the only character able to beat the powerful foes, Krushas, without using a TNT Barrel. Diddy, on the other hand, is much smaller than Donkey Kong, and can get through tight areas more easily. The basic ability, jumping, can be done by both Kongs to defeat enemies, cross pits, or to simply jump to access higher areas. Both Kongs also have the ability to roll or cartwheel into foes. This can defeat the enemies much more easily than jumping on them, and it also gives the heroes an extra speed boost. Sometimes, the Kongs will find themselves requiring to cross a wide abyss too large to jump over. With their cartwheel and roll moves, they can perform a super-jump, making them roll over the gap and jumping in mid-air for an extra boost. Bouncing on a tire can give them an extra boost in the air as well. Though not used as much as jumping and rolling, the Kongs can also climb ropes and swim through water. To climb, the heroes must simply jump up and touch a rope. Climbing can be useful when crossing large gaps, though it can only be done on ropes. Jumping rope-to-rope is common in some levels, but luckily, the Kongs have no trouble in grabbing onto other ropes. During underwater levels, the apes will also use their ability to swim. Tapping the while swimming can make the Kongs move higher as they slowly float downwards. When the Kongs swim, they will not have as much control as on land, and as a result they should be careful. Unlike Donkey Kong Country, Donkey Kong Land has only two Animal Friends, Rambi the Rhino and Expresso the Ostrich, who appear in only two levels apiece. The Animal Friends here are unable to shoot through barrels, and they will suddenly drop to the ground once these obstacles are approached. Note: Some musical compositions of the game are 8-bit arrangements of other compositions from Donkey Kong Country, which were created by David Wise. They are listed with their original title in the "Music theme" sectors of the following table. Graeme Norgate also participated with several new tunes, also listed here. Their names are posted on Norgate's website, and according to him, they pertain to the game's soundtrack filenames. Many items can be found around Donkey Kong Land, and each help the duo complete levels or defeat enemies. Each item has a different purpose. Bananas Bananas are the most abundant items in the game. Donkey Kong or Diddy can collect 100 of them in exchange for an extra life. Banana Bunch Banana Bunches are a group of Bananas, bunched together for a value of ten Bananas. Continue Point This item replaces the Star Barrel from Donkey Kong Country. When touched, it automatically saves the player's progress at that point into that level. Continue Points appear in every level and can be found more than once in a level. Extra Life Balloon Extra Life Balloons give an extra life to the Kongs. These balloons fly away fast, so the Kongs must make sure they act fast to get them. Unlike Donkey Kong Country, the player cannot distinct between value or color because of the Game Boy's monochrome palette. Therefore, every Life Balloon only grants one life. Kong Tokens Kong Tokens first appear in this game. They are featured in every level, mainly in Bonus Areas. In certain Bonus Areas, the Kongs can exchange a certain number of Kong Tokens for extra lives. K-O-N-G Letters K-O-N-G Letters are an essential item. Every level has each letter of KONG letter scattered throughout in order. K-O-N-G Letters have a different role than in Donkey Kong Country because all four of a level's K-O-N-G Letters must be collected to save the game. This mechanism replaces Candy's Save Point. Additionally, in the level, Kong Krazy, KONG Letters can be used as platforms. Four types of Barrels are featured in the game, all of which originate from Donkey Kong Country. Barrel These wooden kegs are very rare items and only appear in three levels. They can be thrown at enemies and bust open walls, both of which destroy the Barrel. Buddy Barrel Buddy Barrels are the most common Barrel. They can a missing Kong, most likely from if it was hit by an enemy. Upon being freed, an icon of the freed Kong displays at the bottom-right corner of the screen, as only one Kong appears on screen at a time. If both Kongs are present, they can use a DK Barrel like a normal one. Steel Keg Also known as Steel Barrels, Steel Kegs are a stronger projectile than normal Barrels. If a Steel Keg rebounds off a wall, it rebounds instead of breaking. They cannot be destroyed, and can roll into more than one enemy. DK or Diddy can even ride on a rolling Steel Keg by jumping onto it. TNT Barrel TNT Barrels are often found in levels, and can be defeat enemies if thrown at them, including Oil Drums. They are explosive and are able to blast away more things than normal Barrels. Donkey Kong near the enemy, Nemo. Donkey Kong Land involves twenty different enemies and hazards, although most first appeared in the SNES game Donkey Kong Country. Enemies listed below in bold are those who have appeared in the prior game. The table also lists the first and last level that these enemies and hazards have shown up in. Noticeably, many of these foes have stayed in throughout the whole game, not making a final appearance until the levels of the last world, the Big Ape City. Swirlwinds can also help the Kongs on their quest, other than harming them. Throughout the Kongs' quest, they not only find the enemies listed above, but also several bosses, who require a little more skill to beat. Each boss appears at the end of all the game's worlds, and must be defeated to allow the heroes to progress. If Donkey or Diddy fall with no visible ground below, the game will mistake the player for falling into a pit and will count it as an instant death, even if both Kongs are present. This includes being knocked back by enemies, but also can happen if either Kong falls to a platform below that is off screen. In some cases the player can obtain the second Kong from a DK barrel, but after getting hit it will still result in a death instead of the other Kong appearing in his place. On release, Famitsu scored Donkey Kong Land a 24 out of 40. Nintendo 3DS Dave Frear, Nintendo Life 8/10 "Going by that instruction book story, the idea that this game would prove Donkey Kong Country was more than just a pretty face is demonstrated rather nicely. Whilst visually it can't come close to the SNES title, by Game Boy standards these are definitely “fancy graphics”, and that doesn't really matter as fans can rejoice in what is basically an extra 34 levels of DKC. Tight controls and a variety of locations and enemies make for an enjoyable platformer. Add in the challenge of finding everything and Donkey Kong Land is a fun game that will keep players occupied for some time." Several creatures and characters who were originally going in this game were abandoned for unknown reasons. These creatures and characters included a fish enemy that was apparently named Pucka (with Fangfish listed as "Pucka Jr."), an unnamed Kong who wore a hat and what appears to be a baby ram named Ram Bunkshus (planned to be an Animal Friend, according to the game's main programmer Paul Machacek). All these unused characters were first advertised in an issue of Nintendo Power, which included renders. Pucka, the unused fish enemy from Donkey Kong Land. Ram Bunkshus, an Animal Friend that was eventually dropped from Donkey Kong Land. Frontward-facing render of Ram Bunkshus. The unnamed, hatted Kong dropped from the final version of Donkey Kong Land. Alternate image of the Kong. For this subject's image gallery, see Gallery:Donkey Kong Land. ↑ Super Donkey Kong GB page on Nintendo of Japan's website. ↑ Nintendo Power #69, page 93.